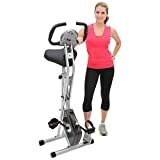 Retailing for $199.99, the Exerpeutic Folding Magnetic Upright Bike with Pulse is available for $149 from Amazon.com, making it one of the most affordable exercise bikes around. Despite its low price point, this bike has features that are similar to those found on bikes priced at $500 or more. The adjustable fit seat turns this bike into one the whole family can use, and it fits users as tall as 6’3″ and as short as 5’3″. A heart rate monitor, tension resistance and a sleek design all make this one of the best exercise bikes priced at less than $200. This magnetic bike from Exerpeutic runs quietly no matter how quickly you move, and its padded seat will keep you comfortable throughout your workout. Looking for an exercise bike that packs a big punch at a low price? This Exerpeutic Folding Upright Bike combines all the features that you want at a price that you need. Designed for people of all ages, fitness levels and sizes, it comes with an adjustable seat that lets you raise or lower the seat to fit your height. Users as short as 5’3″ and those as tall as 6’3″ can use the bike with ease. It also features a space saving design that lets you make a few moves and fold the bike down into a compact shape for storage. The padded seat on the bike hugs your buttocks and provides the comfort that you need during a long workout. Larger and more expensive exercise bikes come with computer screens that feature so many buttons and settings that it might take you years to learn how to adjust the settings. This bike comes with a large and clear LCD computer screen that has just a few buttons. One look at that computer screen and you’ll instantly know how long you spent on the bike and how much time remains on your workout. Located on the center pole of the bike is a tension resistance knob. Twist the knob one way to increase the resistance and in the opposite direction to decrease your resistance. Designed with safety and comfort in mind, this bike comes with slip-resistant covers on each pedal. With other bikes, you might feel your feet slipping off the pedals or have problems remaining on the bike. 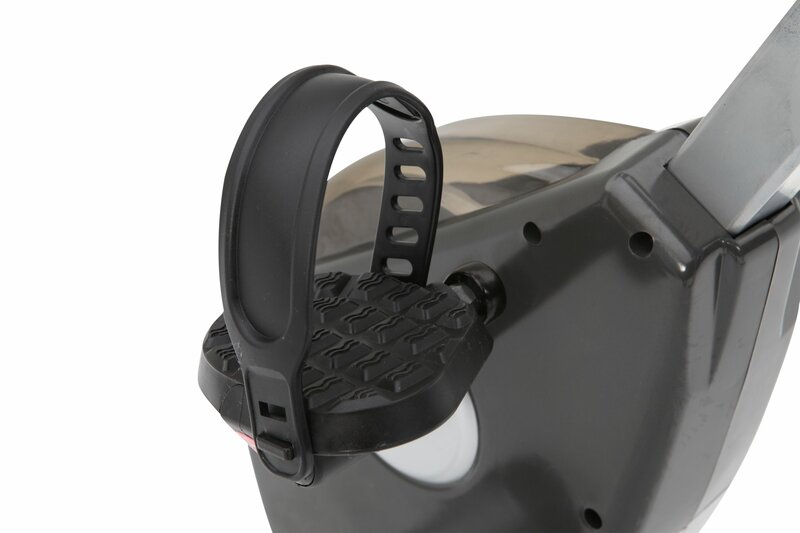 Those slip-resistant pedal coverings will keep your feet from falling off no matter how long you ride. As an added bonus, the bike features leg stabilizers that let you extend your legs to fit more comfortably on the bike. Users love that this upright bike uses a crank system that keeps your motions smooth during your ride. That unique system also keeps the bike running smoothly and reduces any noise that you hear. You can easily ride along with your favorite television show, movie or CD without worrying that the noise from the bike will disrupt your program or music. The tension control on some models fails after regular use. Though designed for both shorter and taller users, some taller users might find that it doesn’t feel as comfortable as they would like. Despite having multiple resistance settings, the highest settings aren’t as high and don’t raise your heart rate as much as the more expensive bikes do. Shorter users need to stretch their leg muscles more to move the pedals. The higher settings often cause the bike to make louder noises. Designed for less frequent users than other bikes. Not everyone can afford to spend hundreds or even thousands of dollars on exercise equipment, and with the Exerpeutic Folding Magnetic Upright Bike, you don’t need to waste a lot of money. Designed for those who want the benefits of an expensive bike at a more affordable price point, this bike features a folding design that cuts its size in half for storage. A large LCD computer screen helps you keep track of your activities, while an adjustable seat and leg extenders help you feel more comfortable. Perfect for homes with people of different sizes and shapes sharing the same equipment, this bike will adjust to fit almost any user in your home. You won’t get the same great benefits and features found on this model from more expensive bikes.